They sparkled Tuesday night. They shot across the Olympic skyline like Halley’s comet, shining brighter than any group of U.S. athletes since the original “Dream Team” of Olympic yesteryear. Yet something bigger, more cosmic rose in front of us while we watched the “Final Five,” as gymnasts Aly Raisman, Gabby Douglas, Madison Kocian, Laurie Hernandez and Simone Biles have tagged themselves, dominate women’s gymnastics just as Michael Jordan, Magic Johnson, Larry Bird and their Dream Team had done in men’s basketball all those years ago. Nobody doubted Biles, Douglas & Co. would come away from the Rio Games with gold medals in the team competition. Since the World Games, they have been without peer, five athletes who had honed their talents to a razor’s sharpness. No one, however, expected that these American women would dominate so thoroughly. As we watched their performances, as we saw their unrelenting drive toward perfection lead to Olympic glory, we were struck by one more thing that defined these five women and has tried to define America, too: Against a political backdrop of white angst, xenophobia and naked racism, the Final Five are a melting pot. The group – two black women, a Latina and two white women – reflect the rich diversity that surrounds us here, a diversity that, too often, we are loath to acknowledge. The five women are a microcosm of America, a rainbow of skin colors and ethnicity that is unmistakably an American thing. What they did, however, wasn’t politics. We don’t need that from these five young women. They were never going to be Olympians Tommie Smith and John Carlos, their raised-fist salute in 1968 Summer Games in Mexico City to all that was wrong in America. Nor should we have expected them to be. 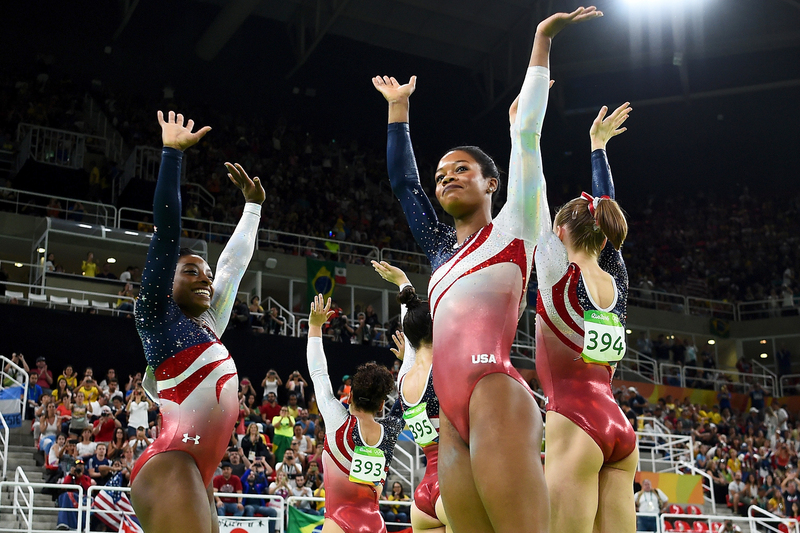 (L to R) Simone Biles, Lauren Hernandez, Alexandra Raisman, Gabrielle Douglas and Madison Kocian of the United States celebrate winning the gold medal during the Artistic Gymnastics Women’s Team Final in Rio de Janeiro, Brazil. Yes, Raisman, Douglas, Kocian, Hernandez and Biles are head-turners; they are also the soul of America. For through them, through all that is ugly about the political climate and hateful rhetoric in their homeland comes an uncommon beauty. We savored the success of five women who showed not a hint of discord among themselves, five women who cheered the performance of each other, five women whose hugs will be a memory most of us will take away from the Rio Games. The hugs had not a thing to do with the politics of race or with their gender or with whatever had unfolded in their yesteryears. In their todays, in their Rio moment, they had the simple reward of chasing a dream and catching it – together. They made no statement larger than that. Of course, those of us here could dwell too much on what their gold means for America’s honor. We could pump our chests and glory in the success of these five women who had done something extraordinary. But what we should take away most from their performance is what is truly American: the spirit that drives its people. We are not a country that has lost its greatness. We are not a country that dwells on what it used to be, because we know what it is now. We also know perfection isn’t possible – not in America, the “imperfect” union that it is. Perfection certainly isn’t found on the gymnastic floors in team competitions. What is found there is art. It’s art formed of blood and sweat and true grit – those thousands of hours of grinding away at a task, the endless repetitions that make for their golden moment, bringing perfection with it. So as we peek ahead at the Summer Games, we can carry in our mind’s eye what these Olympics have already been: a Technicolor portrait of America in all of its diversity. Isn’t that enough for each of us to savor? Justice B. Hill, an Ohio State University alum, is a long-time sportswriter/sports editor who now teaches journalism at the E.W. Scripps School of Journalism at Ohio University. Hill’s freelance work has appeared in SBNation, Ebony.com and BET.com.